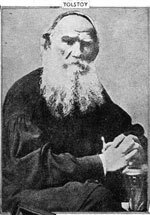 Leo Tolstoi - an article from The Vegetarian (London), 1889. Written not long after Tolstoy's conversion to vegetarianism. The article deals mainly with his views on non-violence and passive resistance. The young Gandhi was a law student in London in 1889, and a member of the London Vegetarian Society. He may have read this. The picture on the right is from the same issue. Count Tolstoi and his Work - from The Vegetarian, 1890. Mainly a review of his latest book: What to Do. Leo Tolstoy and Vegetarianism - a lecture from the 1932 World Vegetarian Congress, given by Valentin Bulkakov, former private secretary to Tolstoy. Tolstoy and the natural world - a short biography. 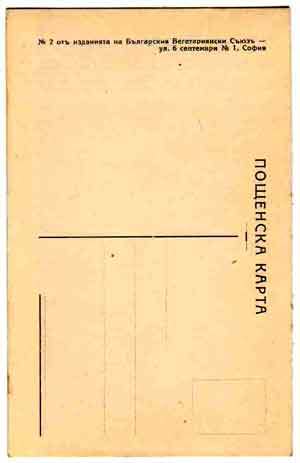 Tolstoy Essays and Letters (PDF 16mb) edited by Aylmer Maude, 1911. Includes The First Step - written in 1892, originally as a preface to the Russian edition of Howard Williams' Ethics of Diet. How Count L.N. Tolstoy lives and works (PDF 3mb) by P. Sergieenko, 1899 p.88: He is a vegetarian from conviction, and for many years has eaten neither meat nor fish, but attributes great importance to vegetable diet, both from a physiological and from an esthetic point of view. Tolstoy and his Problems (PDF 6mb): by Aylmer Maude, essays, 2nd edition 1902 (date of 1st edition no given). 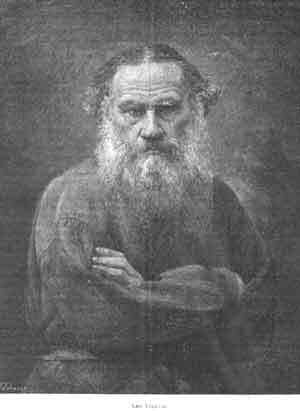 p.20 Tolstoy became a strict vegetarian, eating only the simplest food and avoiding stimulants. A Letter to a Hindu (plain text 50k) by Tolstoy, December 1908, with an intro by Gandhi 1909. The Life of Tolstoy Vol.2 by Aylmer Maude, 1st edition 1910/11. Gives accounts of his vegetarianism from Autumn 1885. LEO TOLSTOY is another Genius that cannot be pigeonholed in any one category. Novelist, Humanitarian, Warrior for Peace, Russian Philosopher, his name is a household word throughout the world. 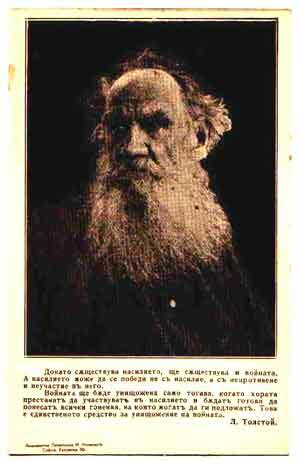 Tolstoy lived very simply on bread, porridge, fruits, and vegetables. "If a man's aspirations towards a righteous life are serious.. .if he earnestly and sincerely seeks a righteous life, his first act of abstinence is from animal food, because, not to mention the excitement of the passions produced by such food, it is plainly immoral, as it requires an act contrary to moral feeling, i. e., killing - and is called forth only by greed." "It is horrible! It is not the suffering and the death of the animals that is horrible, but the fact that the man without any need for so doing crushes his lofty feeling of sympathy and mercy for living creatures and does violence to himself that he may be cruel. The first element of moral life is abstinence." "Such a situation, is dreadful. Not the suffering and death of the animals, but that man suppresses in himself unnecessarily, the highest spiritual capacity - that of sympathy and pity towards living creatures - and by violating his own feelings, becomes cruel. And how deeply seated in the human heart is the injunction not to take life. But by the assertion that God ordained the slaughter of animals, and above all as a result of habit, people entirely lose their natural feeling. "First that she is so delicate that she cannot be sustained by vegetable food alone ; and secondly, that she is so sensitive that she is unable. not only herself to inflict suffering on animals, but even to bear the sight of the suffering. "Whereas the poor lady is weak precisely because she has been taught to live upon food unnatural to man ; and she cannot avoid causing suffering to animals - for she eats them. "The wrongfulness, the immorality of eating animal food has been recognized by all mankind during all the conscious life of humanity. Why, then have people generally not come to acknowledge this law? The answer is that the moral progress of humanity is always slow; but that the sign of true, not casual Progress, is in uninterruptedness and its continual acceleration. And one cannot doubt that vegetarianism has been progressing in this manner. My father, Isaac Tepper, was born in the Ukraine in 1897. At the age of 8, he became a vegetarian on his own, against the pressure and bribes of his parents. They said he was crazy, and he actually believed it until he read about Tolstoy. I am a lifetime vegetarian, and so is my husband, David Konviser. We have four children who are third generation vegetarians on both sides of the family, and we have one grandchild, who is a fourth generation generation vegetarian.